I got out for a little while yesterday, wanting to check out a new site to see what the terrain was, and if it was worthwhile to return to with my Dad. I do this quite often, to get a feel for the area beforehand. When I returned home, and was putting my gear away, I noticed my Lesche was missing. I wasn’t too alarmed, figuring it was somewhere in the car, and went back for a second look. After a thorough check, it became apparent I had lost it in the woods. Now I may not be the daintiest of females when crashing through the briars, but when it comes to losing things, I’m very careful, and after years in this hobby, and watching dozens of folks lose pinpointers and digging tools, I keep pretty good track of my stuff. So I was quite upset. Not to mention, I was thinking, where the hell am I going to get the extra cash to replace that?? Envirnmentally damaged colonial coins don’t exactly bring in a lot of profit. About an hour later, I received a message on Facebook from Dave Wise that said “Congratulations”, then another that said “Did you know you won?”, and I’m thinking what the heck is he talking about? 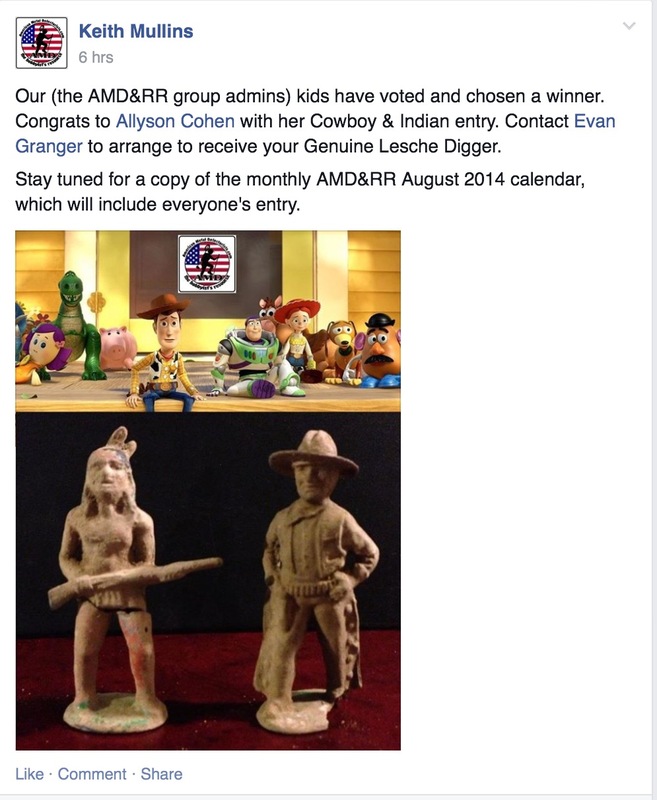 At the same time he texted me back, I realized what he was talking about–It was the contest I entered on the American Metal Detectorists Relic Recoverists Group Facebook page, where you had to post a pic of your favorite toy found while metal detecting and some information about it. And guess what? I won, and the prize was a Lesche digger!!! If ever there was some awesome communication going on with me and the Universe, that was it. I wish all things in life came so easily. Needless to say, I’m elated, and thankful. Now, I’m on my way to scoop up Dave for a hopeful day of hunting. Its always an adventure when hunting with Dave, because no matter how sucky a site may or may not be, he always manages to find or do something that is worth writing about. I just hope there are no angry bees or hornets waiting for us. HH back to you as well. I know–pretty neat to lose and win one in the same day. Sometimes things just work out. Sorry to hear you haven’t been able to get out. I don’t think I could stand not being able to get out at least once in a while. I go stir crazy, and miss the exhilaration of a neat find. Glad you enjoy the posts. I work on keeping them light but interesting; and hope the humor can give someone a chuckle or two. Glad you won a replacement but it did get me to wondering. How come nobody ever post diggers or pin pointers as their find of the day? Really, how deep can those suckers sink in to the dirt before they can’t be detected? I don’t know Joe. Finders keepers maybe? They are a necessary tool, and can be pricey as well.